I paid a customer a visit a while ago and was requested to assist with a SQL Server Failover Cluster issue they were experiencing. They had internally transferred the case from the SQL team to folks who look after the Windows Server platform as they could not pick up anything relating to SQL during initial troubleshooting efforts. Now that we have all this information, let’s look at how you would resolve this specific issue we were facing. Before that however, I would like to provide a bit of context relating to cluster disks, especially on Asymmetric Storage Configuration. Note: The 20 GB drive is presented from the SAN and is not added to the cluster at this stage. I used Hyper-V Virtual Machines to reproduce this issue in a lab environment. For the SAN part, I used the iSCSI target that is built-in to Windows Server. 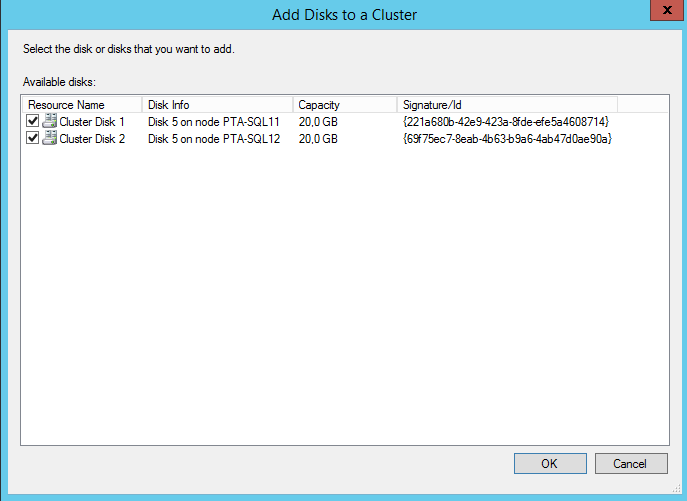 What happens when you Add Disks to Cluster? Let us first take a look at the disks node in Failover Cluster Manager (FCM) before adding the disks. At this stage, everything still works fine as the SQL binaries volume is still available on this node. 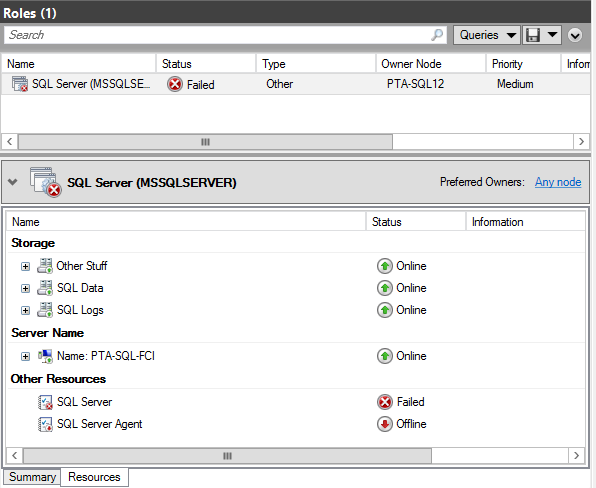 Note that the “Available Storage” group is running on PTA-SQL11. What happens when you move the Available Storage group? The Failover Cluster validation report does a good job in letting you know that disks are only visible from one node. By the way, there’s also good information here on what’s considered for a disk to be clustered. A warning is more like a “proceed with caution” when looking at a validation report. Failures/errors mean that the solution does not meet requirements for Microsoft support. Also be careful when validating storage as services may be taken offline. 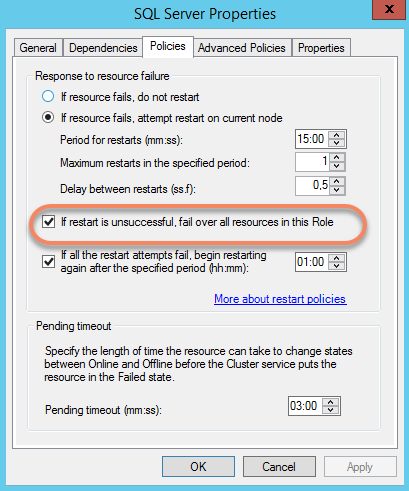 In the following snippet from the cluster log, we see an example of the Failover Cluster Resource Control Manger (RCM) prevent the move of the “Available Storage” group to prevent downtime. To get the service up and running again, we had to remove both Disk 1 and Disk 2 as cluster disks and make them “local” drives again. The cause was that an administrator had added disks that were not meant to be part of the cluster as clustered disks. Disks need to be made online from a tool such as the Disk Management console as they are automatically placed in an offline state to avoid possible issues that may be caused by having a non-clustered disk online on two or more nodes in a shared disk scenario. I got curious after this and reached out to folks who specialize in SQL server to get their views on whether the SQL binaries drive should or should not be shared. One of the strong views is to keep them as a non-shared (non-clustered) drives, especially for cases on SQL patching. What happens if SQL patching fails in a shared drive scenario for example? Anyway, it would be great to hear from you through comments.